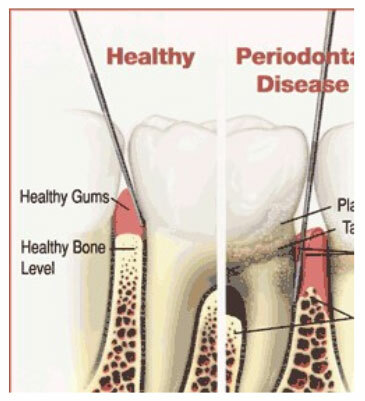 Gum disease is one of the most common diseases known to man, affecting over 90% of the population. In fact, gum disease involves a number of different processes, which are linked, and may progress from one to another over the course of one’s life. The most common cause associated with gum disease is the build up of soft (plaque) and hard (calculus or tartar) deposits, which contain bacteria, on your teeth. However other risk factors include smoking, a family history of similar gum problems, and some other diseases such as diabetes. There is also thought to be a link, as yet unclear, with the development of heart disease. The only sign may be some bleeding when you brush or floss your teeth. Typically a single visit with our hygienist will be adequate to remove the offending deposits, and to rectify your cleaning techniques. Ongoing care typically involves twice yearly visits to our hygienist, and of course, regular dental check ups. As well as some bleeding, there are signs of early pocket formation in the gums, with bone loss around some teeth. Appropriate care involves modification of your cleaning techniques, recording of the precise extent and location of these pockets, and active treatment to halt and reverse the disease process by thoroughly cleaning all tooth surfaces. Typically this might involve two longer hygiene visits initially, with follow up on a 4 to 6 monthly basis to ensure that health is maintained. Early intervention ensures that long term damage is avoided. The advanced form of the disease may have progressed to the stage where the future of some teeth is compromised. Teeth have often lost bone to the degree that they become loose. After collecting all available data including x-rays and periodontal charts, a course of up to four appointments will be required to actively treat the diseases, by thoroughly removing all the deposits. Ongoing monitoring of the problem is essential, and follow up cleaning every 3 to 4 months is required. If the disease fails to respond, referral for specialist periodontal advice may be required. Ongoing periodontal health involves an active partnership between the patient, hygienist and dentist. It is possible to maintain significantly compromised dentitions for a lifetime with the involvement of all concerned.